Summer in the garden is one of my favorite times of the year. So many elements in the garden space are in constant motion and work together like a symphony creating the natural rhythms and harmonies of the season. The buzzing of the bees as they visit the summer blossoms, the swish of the cucumber leaves hanging from their trellises as they are caught by the breeze, and on certain days the whispered gasps and exalted exclamations of children can be heard letting me know that summer has arrived. This summer I was delighted to share my love for summer with children and youth from two partner organizations, Cottage Cove and Youth Life Learning Center. Grade by grade -- kindergarten through 4th grade -- each group began their introduction with tours at the Wedgewood and McGruder gardens. While walking through the garden we smell and taste various herbs, fruits, and vegetables, and try to identify familiar crops grown in ways that are unfamiliar to them. Seeing growing carrots for the first time, many students mistook the root vegetable for an herb, but it wasn’t until I brushed away the dirt did they see the beginning of the familiar orange root. At Wedgewood, the tour must include petting the chickens and braving the bees. At McGruder, we spend time trying to guess the fruits growing in the orchard. Each tour is a sensory experience. After the initial introduction the subsequent garden lessons range from reviewing the categories of crops we eat (fruit, root, and leaves) and in which seasons they grow, discussing flower parts and ending the lesson by planting flowers in take home pots, and creating bird feeders while talking about seed dispersal. My goal for each lesson is to cover all the planned information while still providing time for questions, discussions, and the inevitable tangents that occur when working with children. Working with youth I am always amazed by the connections their minds make. Once when I was leading the lesson on crop categories, I had asked the students to name a few root vegetables, but they had gotten stalled after naming potatoes and carrots. As a hint, I asked the group “What vegetable makes you cry if you slice it?” Thinking I was going to immediately hear onions, I called on the first hand I saw, but the answer that came out instead, loud and proud, was “sushi”. After about 5 minutes of laughter we collected ourselves enough to resume the lesson, but I was still chewing on that answer trying to puzzle it out as we said our goodbyes for the day. Was this just one of those random answers you get from kids or was there a connection I was missing. I thought about it. One of the main things people put on sushi is green wasabi paste, which comes from the root of the wasabi plant, and if you eat too much it will definitely make you cry, among other things. So, based on his experience the student was correct. Now, to be honest I don’t know if it was my own mind trying to force a connection between sushi and root vegetables or if, for the student, that association was instantaneous. I like to think the latter. 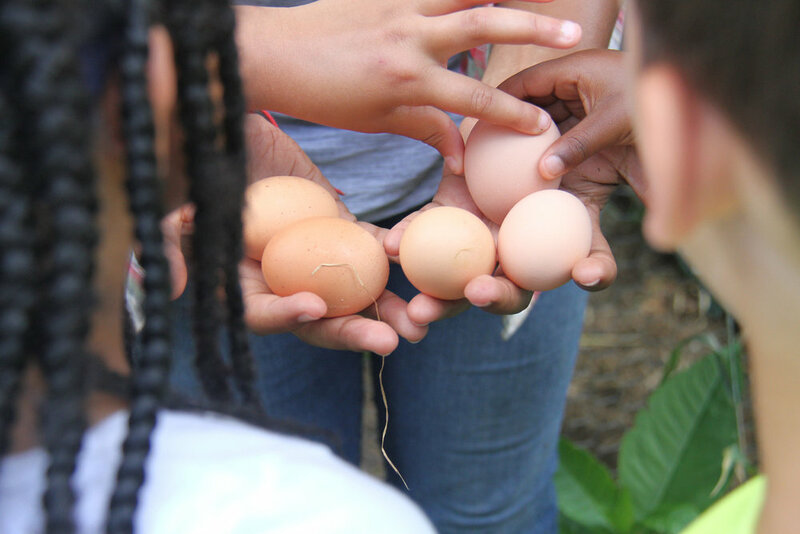 I describe leading kids through the garden as organized chaos at best, but there are a couple of rules each student knows to follow when they step in the garden. The first occurs during the lesson. If there is something that I am passing out to be eaten it must be tasted. Many kids tell me they are “allergic” to the color green and will immediately say no thanks. I even get a skeptical look from some when I pass out cherry tomatoes, but as soon as they take a bite their eyes pop and most ask for more. So we have an agreement that anything passed out must be tried because they will never know if they like something, if they don’t try it first. The second rule comes at the end of each lesson. We gather around the sorrel plants (or 'sour leaf plant', as the kids call it), to review what they learned that day. Each student says something about the day’s lesson without repeating something previously stated, and they are rewarded with a leaf that tastes like the skin of a green apple. By using this method of reflection I have learned that chickens will always be a popular subject while, for the children, the joys and intricacies of compost aren’t nearly as interesting. If a student is struggling to come up with a fact for the day, they are allowed to ask a friend for help and I try to provide a better hint than the one I used for onions. That way each student can walk away knowing two things: That the garden is a place where people and the earth work together harmoniously, each needing each other to thrive, and that the garden also provides tasty treats if you know where to find them.